Knowing that the author can still recite "Dragon Slave" makes this series make more sense to me. I also must admit that I am enjoying it more than its anime adaptation not just because it has a better narrative flow, but also because there are no voices. 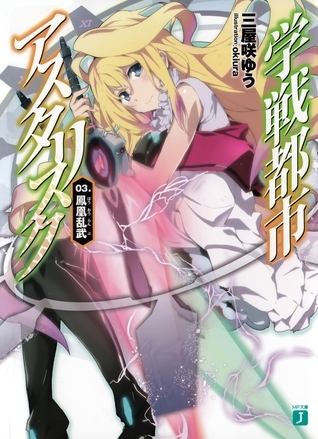 Wrapping up the first cour of the anime series when adapted, this novel of The Asterisk War begins the Phoenix Festa arc with a bang. This one definitely started off on more of the meh side, but got better as it explored two new characters: Irene and Priscilla Urzaiz. I also like how the match at the end of the novel was written between those two and Ayato and Julis, as it was very suspenseful and had me holding my breath despite knowing the outcome.I will say that again, the exposition felt VERY heavy with this volume, and I can only hope it gets better instead of worse. It's starting to take up too much space for my liking. Plus, it took me a while to get through this since I also felt the pacing was a bit slow, but it got going after getting a fourth into it. The story and characters are still investing enough that I want to continue on, which is the best thing.Time to see where this arc in the LNs takes us! I'm very interested to see how Miyazaki writes the next volume, especially with how a certain character will fit into the grand scheme of things here. The Asterisk War isn't the greatest light novel series around. It dwells on the harem type way too much imho. However, some darker elements were added on this 3rd book that I enjoyed.Easy read, not great but good.